Built on land originally designated for a traffic roundabout, a long drawn out process led to planning permission being granted in August, 1959. November 2009, looking through where the Astoria once stood. 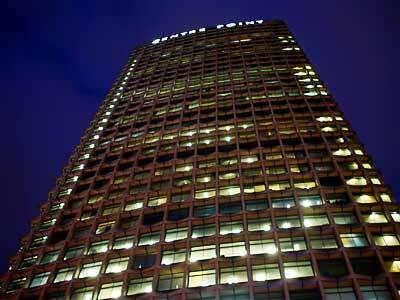 Centre Point at night. Note the illuminated name at the top, 2002. 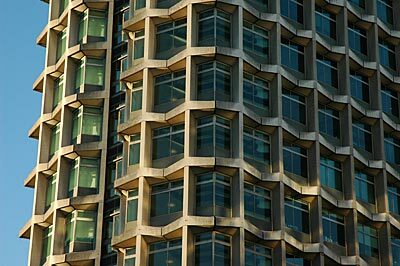 The building stands 117m (385ft) tall, accommodating 35 floors of office space, with its distinctive concrete pattern making it an instantly recognisable London landmark. 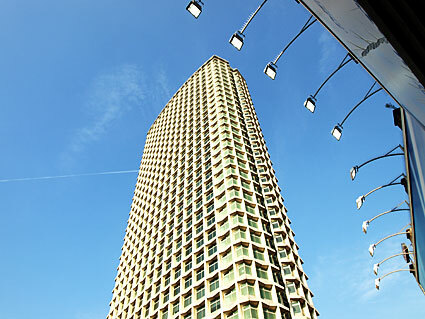 Work started on the tower in 1962, to a design submitted by Richard Robin Seifert & Partners (who went on to build the 43-story Tower 42 in 1980). 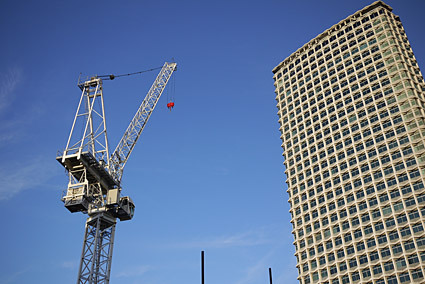 The building was constructed using prefabricated precast-concrete, H-shaped units lifted into position by an internally sited crane designed to rise in height with the building. 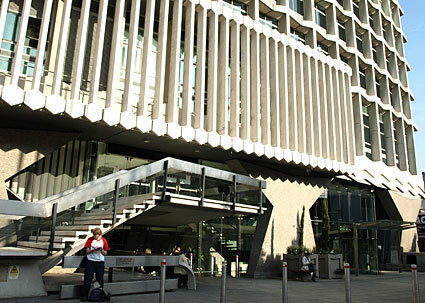 The units were bolted to each other and to the concrete floor to become the load-bearing façade of the building. 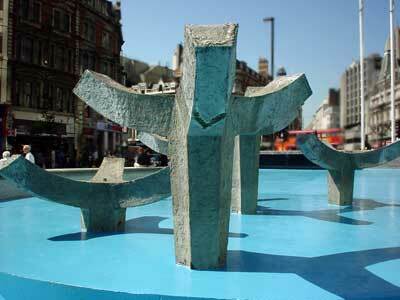 Loads were also designed to be carried by two pairs of precast-concrete columns in the centre of the building. The architect, Seifert explained that the H-shaped units 'should provide interesting modelling in a self-finished material capable of withstanding the extremes of exposure and the elimination of wet materials will considerably speed up the construction time'. 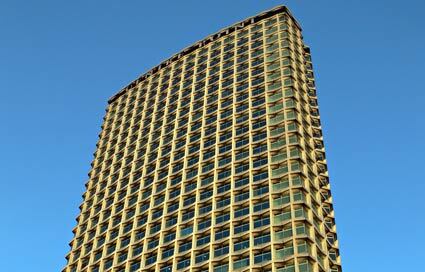 Centre Point was completed in 1964, offering 180,000 square feet of office space. 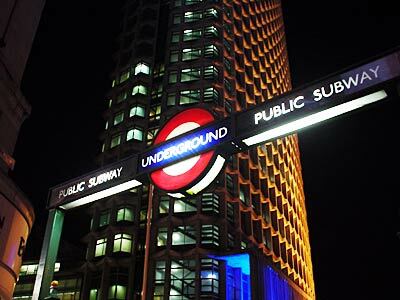 Tube station and Centre Point, taken from the Oxford Street/Tottenham Court Road junction. 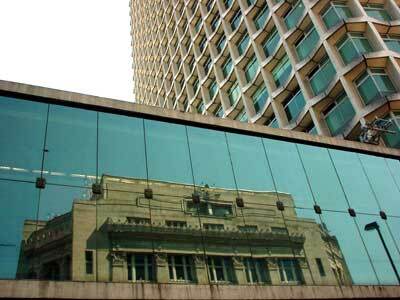 Reflections on the north side of the tower, facing New Oxford Street. The road/pedestrian underpass runs underneath. Critics weren't too pleased with the building, deriding its 'murky and filthy underpass' underneath which quickly proved popular with junkies, the homeless and ne'er do wells. 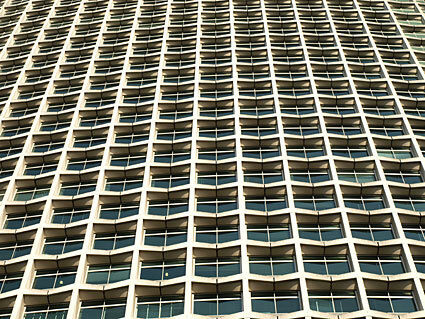 Outrageously, the 200,000 sq ft building famously stood empty for nearly a decade after it was completed - and when current owners Targetfollow took over in 2005, 12 floors still remained vacant. Seeing this vast tower standing empty for so long while so many people were homeless led some people to suggest that the building 'came to embody the greed of the UK property industry' [Source]. The protest went on to inspire the name for a new homeless charity, Centrepoint. 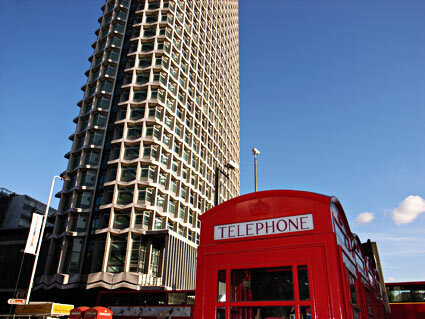 Centre Point features a set of street-level water fountains which seem to work to an entirely arbitrary timetable, often lying dormant throughout hot summers before suddenly bursting into life in bleakest mid-winter. Although attractive, they haven't found universal favour, drawing complaints from members of the public who object to getting a face full of spray as they try to negotiate the miserably narrow pavement around its base. Looking up the building from the corner of New Oxford Street and Charing Cross Road. A nearby stairway leads down to Tottenham Court Road tube station. 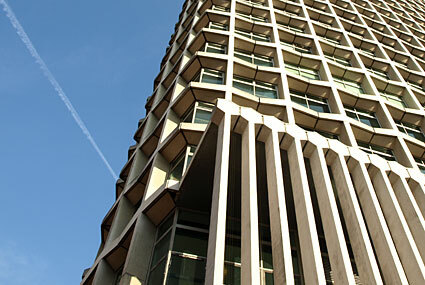 During 2002-2003, Centre Point's office and building reception areas were extensively refurbished to the requirements of the Planning Department, English Heritage and the Project Architects, Gaunt Francis Associates. 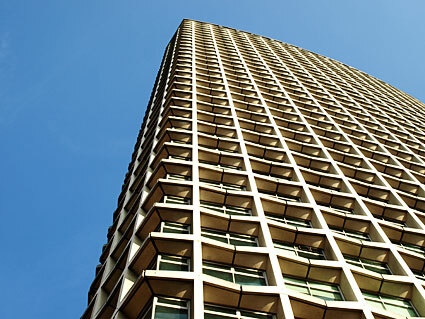 Centre Point has withstood years of criticism and disuse to earn the accolade of a Grade Two listing, with the Royal Fine Art Commission praising the building as having an 'elegance worthy of a Wren steeple'. 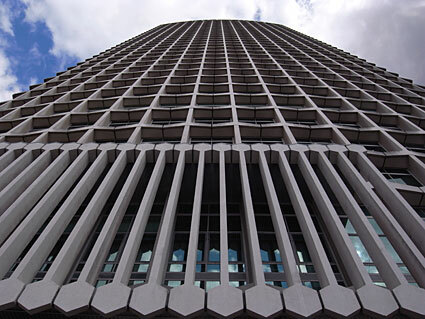 And although there's no denying that it's not quite of the highest architecturally quality, it's still an innovative building of national significance that may finally find a place in Londoner's hearts. 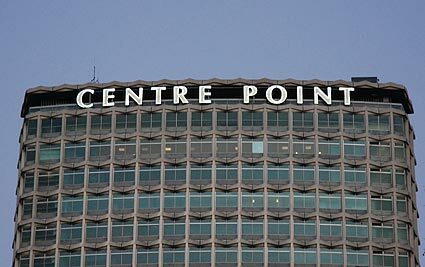 Close up of the large illuminated 'Centrepoint' sign at the top of the building . 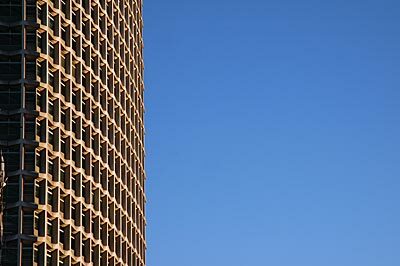 Centrepoint from the north, on a late autumn afternoon. Obscure Fact! 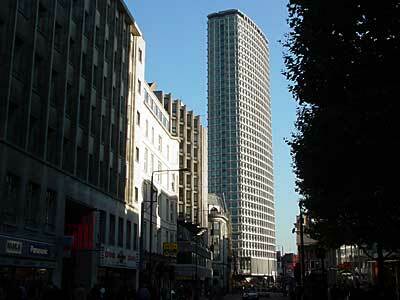 Centre Point featured on the cover of 1970s folkies Lindisfarne single, 'All Fall Down'. I don't think they liked the tower much! 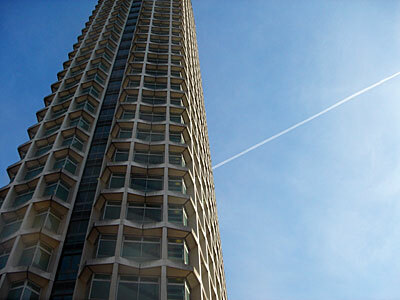 and the trees tell us secrets that took ages to learn..."
Jet trails and Centre Point.